What Is the best and fastest H.265/HEVC video converter for Windows 10 to convert 4K GoPro HEVC/H.265 video to H.264? Windows 8 needs H.265 video converter/encoder. How about Windows 10? Microsoft announced that Windows 10 added native support for HEVC/H.265 and MKV, which means you can play H.265/4K videos on Windows 10, provided that your PC running Win 10 is equipped with 4K display, or the video will be auto degraded into 1080p. Streaming 4K movies from Windows 10 to 4K UHD TV or directly play HEVC/H.265 video on 4K TV via USB would be fantastic, which requires converting H.265 to H.264, MPEG-4, etc with a best Windows 10 H.265 video converter for codec incompatibility issues. As you probably know, 4K videos keep growing in popularity. But to realize the playback of 4K UHD movies on Windows 10, you will have to unlock a series of 4K video codec puzzles – HEVC/H.265. This tutorial explores the solutions for several interconnected H.265/HEVC issues, solving problems like what is the relationship between 4K and HEVC/H.265 and which is the best Windows 10 H.265 video converter to encode a H.265 video or convert H.265 to H.264, MPEG4, MOV, FLV, MKV, etc on Windows 10. High Efficiency Video Coding, abbreviated in HEVC, also known as H.265, is a successor to currently most commonly used video compression format H.264, which is said to double the data compression ratio compared with the previous. At present, 4K (2160p) resolution videos can only be contained into two formats – MKV/H.265 and MPEG. And the average bit rate reduction for HEVC is 64% for 4K UHD and 62% for 1080p. However, most 4K TVs cannot decode H.265/HEVC, leading to the failure of downloaded 4K/H.265 videos playback on TV. And streaming H.265/4K video to TV on Windows 10 for watching won't be possible as well. That's why you need a best H.265 video converter. Q - "How to play MKV file encoded in HEVC on TV or how to convert H.265 into some other format? The video file has HEVC video codec and AC3 audio. I want to play it on TV, which does not support MKV container or H.265 codec. Any way to convert H.265 to H.264 to better fit Windows 10 or to play on TV?" How to Convert H.265 to H.264 on Windows 10? 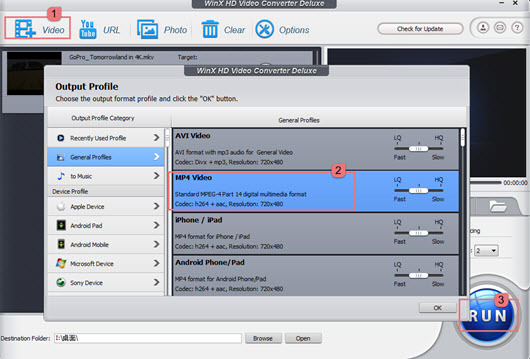 WinX HD Video Converter Deluxe, as one of the best H.265 video converter for Windows 10, adds support for H.265/HEVC codec right after the appearance of this very codec mainly for 4K video, enabling users to both encode videos into H.265 and convert H.265/HEVC to up to 320 video codecs for playback on iPhone, iPad, Apple TV, Chromecast, Android mobile and tablets, etc. Step 1: Download Windows 10 HEVC converter and launch the software. Step 2: Click "+" button to load your H.265 video from local media library or download a H.265 video directly with this Windows 10 HEVC converter by clicking "YouTube" button and then follow the download wizard. Step 3: Go to Output Profile -> General Profiles -> MP4 Video (codec: h264 + aac). Also you can encode video into H.265 by choosing HEVC Video under PC General. Step 4: Tap button "OK" and hit "RUN" to start converting H.265 to H.264. Take the time to check out what the video files playable on Apple, Sony or Samsung Smart TV are before you make up your mind as to on which device you are going to play the H.265 video. Then use the best H.265 video converter software to convert H.265 to H.264 MP4, AVI, WMV, MOV, FLV, etc. * Best H.265 video converter for Windows 10 to download and convert sharp H.265/4K, H.264/1080p video from YouTube. 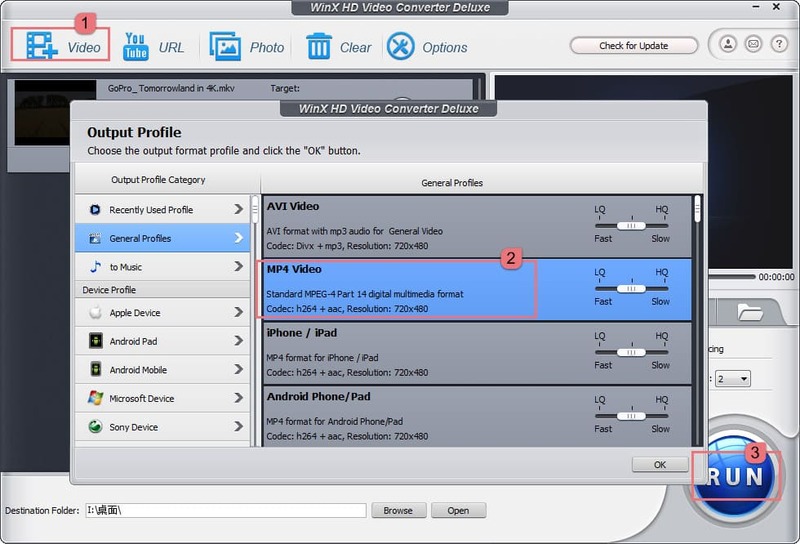 * Download and convert H.265/MKV video to MP4, H.264, MPEG, AVI, WMV, FLV, VOB, MOV, MKV, M2TS, etc. * Download and convert H.265/MKV video to Windows 10 PC, Mac, iPhone, iPad, Apple TV, Android, Samsung, HTC, PSP etc. Best HEVC Decoder Helps Play HEVC/H.265 Videos on TV, Android, etc.